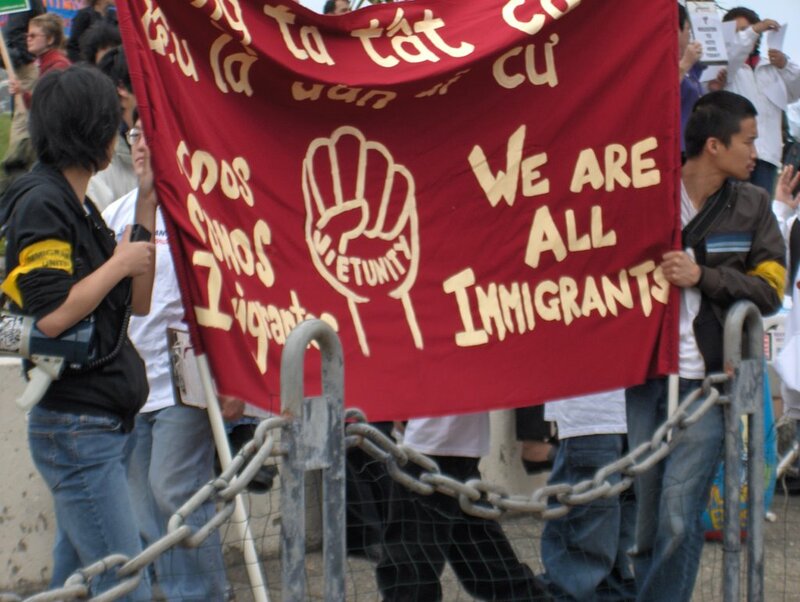 On the eve of the historic May 1st actions for immigrant and workers' rights here and all over the US I am blogging from Phoenix/Tempe Arizona area - the hotbed of Minutemen Project/Sen. 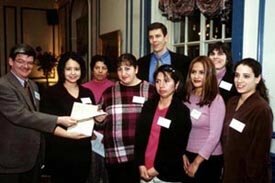 Jon Kyl/Prop 200 & 203 [anti-immigrant/anti-bilingual education groups]. More on May 1st Actions in your area. I am here with educators, school board members and activists from California, Arizona, Texas and New Mexico to support Latino student achievement and learning. 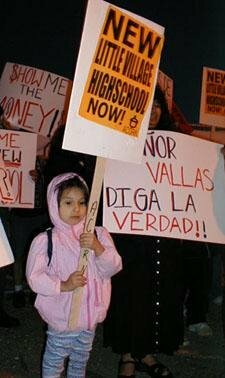 Some of us have been inspired by the walkout/'blowout' activism of youth in many of our school districts, but the discussion on these matters has been mostly in the hallways, but not in the official Arizona, California or Texas state school board association led workshops and plenary sessions. There has been no discussion too of the racist/anti-immigrant Prop 203 [2000 - multimillionaire Ron Unz's AZ version of his 1998 Prop 227 in CA] and Prop 200 [2004 - the son of CA's 1994 Prop 187] or of the general assault on bilingual education and immigrant communities in the education system. As usual there's no talk or consciousness of the historic 1920's Phoenix/Tempe educational justice case Romo v. Laird or the 1969 Chicanos Por La Causa-led boycott of schools and fight to change the school system. For background - see the MALDEF analysis of school desegregation - Black, White and Brown. But local immigrant rights and social justice groups here are planning for more large demonstrations targeting their elected officials for May Day. Though some principals and school districts are cracking down on students' rights to protest and raise their voices, many young people have been encouraged by the local and nationwide upsurge in activism. Like California, Idaho and Utah - Arizona is imposing their AIMS high school exit exam this year and high school students must pass the test in order to receive a diploma. 27 states now impose this form of high states testing. Local student and parent groups here say that the exam has 'pushed out' many low income, Latino, African American and special education students - and the schools systems, especially in the rural Native American and Latino areas and in the urban centers are still largely segregated and unequal to the schools in the suburbs and predominantly 'Anglo' neighborhoods. high percentage of students across California had scored low on the test, so the exit exam would be put on hold until further notice. But now the exit exam is back, standing between my cousin and his education. I still see the test, and his reaction to it, as evidence that the school system has failed my little cousin and his generation of students. With little hope of receiving a high school diploma or anything else to show for all the effort they put into their education, it's not surprising that some students give up and just "go dumb." Los Angeles Mayor Antonio Villaraigosa has proposed a drastic take over of the Los Angeles city schools. This effort follows in the wake of similar take overs in Chicago, New York, Philadelphia, and to a lesser extent Sacramento. The motivation of these efforts is positive; they want to improve public education in areas that are failing. Clearly the schools are failing for central city and poor kids. In New York and Chicago, the mayors claim some positive movement toward school improvement. However, before we go down this path, lets ask the question from the other direction. If schools are failing, what is the role of Mayors at present? Without taking over schools, Mayors could do a great deal. Urban schools would be improved – at times dramatically- if gangs and violence were removed. City administrations could provide police, probation, and youth counselors and gang intervention teams to dramatically reduce crime and violence around the schools. Urban schools would be improved by providing decent buildings, grounds, and facilities. Certainly city administrations could provide improved buildings and maintenance and lease these back to the schools. You see, the proposal to have Mayors take over schools is based upon a view that the problem of urban schools is a problem within the school walls. The proposal assumes that schools can be radically improved while the surrounding society is divided and impoverished. I know of no evidence to support this view. I think that we should demand that legislators do their jobs- fund the schools, and that Mayors do their jobs – provide a decent, safe environment, and at the same time demand that teachers improve the schools. If you know of some instances when politicians improved the schools, please let me know. I do know that it was a marginal fix here in Sacramento. 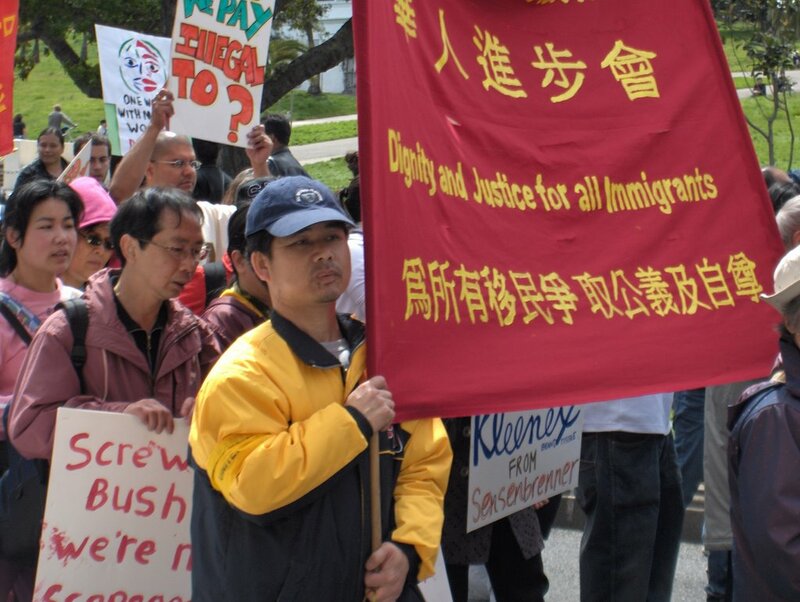 Community, labor, student, and faith-based groups across the Bay Area are organizing on May 1, International Workers' Day, to raise immigrant voices and put a stop to anti-immigrant bills in Congress. voice political speech at school. release. Contact the National Lawyers Guild Hotline if your rights have been violated - 415-285-1011. Check out the Website of a Multigenerational group of East LA activists For the Students! Great info on protecting your rights to engage in political actions and organizing. 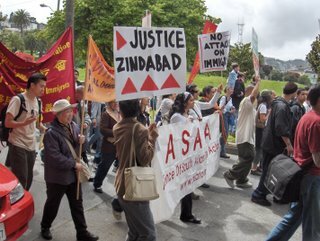 My daughter and I had a great time marching today in San Francisco with the Asian American contingent in addition to many grassroots immigrant rights groups, the May 1st Alliance, and so many many families that turned out for the Bay Area Day of Action for Immigrant Justice. I saw parents, students and teachers from Balboa HS, Peabody ES, McCoppin ES, James Lick MS, Buena Vista ES, Bessie Carmichael ES/Filipino Ed Center, Creative Arts Charter K-8, and Lowell, Lincoln, Newcomer, Mission, Burton and Marshall High Schools! --A number of white activists and African American leaders are circulating 2 well-written statements urging their folks to stand in solidarity with the immigrant rights movement. The Catalyst Project and Heads Up Collective initiated this statement to white activists and communities. Dozens of organizers and activists have already signed on in solidarity. their demands. As white people, most of us with U.S. citizenship, we call out to our white communities totake to the streets for immigrant rights. We must demonstrate that the rightwing racists, from the Minutemen to in the Congress, do not represent us! If you agree with their principles, they invite you to sign this letter and make your signature a commitment to putting them into action inyour work and life. Boycott Against Immigrant Repression and for Gulf Coast Reconstruction! 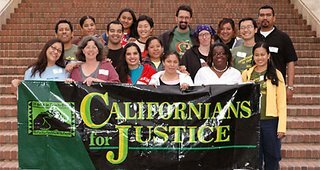 Build the Black and Brown Alliance for Justice and Human Rights!Please forward to others and sign the petition. www.petitiononline.com/bbunity/petition-sign.html? Hurricane Katrina was a 21st Century snapshot of the genocidaldirection of the US government. It exposed the reality of conditions faced by working class African Americans and peoples of color underUS style democracy. It also creates a new sense of urgency to mobilize power outside of the electoral arena to challenge racist and repressive legislation like HR 4437. There has yet to be a massive upsurge that expresses the deep outrage of the African American masses against the US government for this crime against humanity. AP sure knows how to tap into NCLB outrage alright but it's outrage in all the wrong places. I think this is a seriously covert article pushing an agenda, and, hint, it's not the progressive one, folks. If you don't question their premise, boy, it's easy to fall for their propaganda. And, look, even Alternet takes the bait, hook, line and sinker. See also: An Old Soul or NCLB =Contractors profit and AP sets it up for Spellings to come in and save the day ; Angela Valenzuela's Eductional Equity Blog from Texas ; For general progressive critiques of NCLB see Rethinking Schools ; Harold Berlak's Manual on NCLB & High Stakes Testing; or Kathy Emery's Education and Democracy website. Despite strong advocacy from immigrant communities, bilingual education advocates and civil rights groups, the California State Board of Education has done it again - screwing English learners and immigrant students throughout the state. See Duane Campbell's Choosing Democracy Blog. In its decision yesterday to adopt mainstream criteria for materials for Reading/Language Arts/English Language Development, the state board of education missed an historic opportunity to demonstrate true and visionary leadership by amending and adopting criteria for new reading textbooks to address low test scores and narrow the achievement gap for English learners. Critics of the current options for schools - including Assemblywomen Judy Chu, D-Monterey Park, and Jackie Goldberg, D-Los Angeles - wanted the board to also let schools use textbooks they said would help non-English speakers with vocabulary while learning basic subject matter. The new textbooks could have provided California’s 1.6 million English learners with much better materials to prepare them for the rigorous tests of Reading/Language Arts and English proficiency. Shelly Spiegel-Coleman, project manager for multilingual curriculum at the LA County Office of Education, said her group and others who favored change were shut out of talks. "The curriculum that's going to be sustained for the next eight years ... will have the same lessons, same text, same teachers guide, no matter who sits in front of the teacher," she said. A grass-roots advocacy group sued the state in Alameda County Superior Court this week, seeking more time for the Legislature to review alternatives to the high school exit exam. If successful, thousands of public high school students in the class of 2006 who have failed the test would receive their diplomas. ...It is the second exit exam-related lawsuit filed this year. Ten high school students and their parents sued in February to stop the exam, alleging the state did not adequately prepare all students for the test or find alternatives. "California officials have had five years to develop workable alternatives, but they didn't even start looking until December," Public Advocates managing attorney John T. Affeldt said. "This suit is to ensure that 48,000 high school students won't have to pay the consequences for the superintendent and state Board of Education's delay" in considering alternatives, he said. Si Se Puede! (Yes we CAN!) - Caramel, honey, white and dark chocolate arms and multi-lingual voices rose in unison as they marched down the rain-slicked streets of Richmond and San Pablo toward a school board meeting deciding on a landmark challenge to the California High School Exit Exam (CAHSEE). On Monday April 10th, the West Contra Costa Unified School District (WCCUSD) voted no on a proposal brought forth by school board member Dave Brown which would have acted as an alternative to the California High School Exit Exam (CAHSEE). The proposal included granting high school diplomas to students in the district who successfully completed all of their high school requirements as well as a Senior Year Demonstration even if they did not pass the much-maligned California High School Exit Examination (CAHSEE). 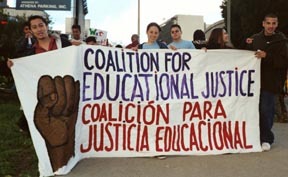 also check out the analysis by Los Angeles' Coalition for Educational Justice, another grassroots organization that has been organizing a movement of parents, teachers and students for educational justice and equity. The AP is reporting more huge high school student initiated walkouts or 'blowouts' in largely Chicano/Latino communities - this time in Denver this morning. It seems there hasn't been this level of youth activism in Denver since Rudolfo 'Corky' Gonzalez and the Crusade for Justice and many others mobilized youth conferences and a new movement in the late 1960's until the Denver police and COINTELPRO eventually shut them down. 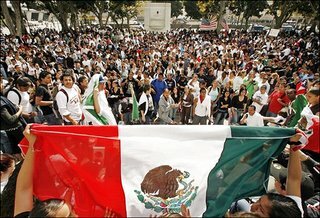 See my previous blog on the passing of Corky Gonzalez in 2005.
high school students and adults descended on the state Capitol today for a rally to support immigrant rights, police said. Marchers jammed inbound lanes of Speer Boulevard, a major route to downtown, and temporarily blocked other intersections as they crossed, but no problems were reported, police spokeswoman Virginia Quinones said. Meanwhile, in San Francisco and throughout the Bay Area - Community organizations, labor, students, and faith-based groups are organizing the Bay Area's largest mobilization for immigrant rights on Sunday, April 23. Join us and bring your friends and family! Our next planning meeting is scheduled for Wed, April 19 from 5:00PM to 7:00PM at SEIU Local 87, 240 Golden Gate Ave. between Hyde and Leavenworth. As part of the mass mobilization, Bay Area Faith Communities invite you to join in a day of prayer and action to unite for just comprehensive immigration reform. After mass and a press event, communities of faith will join others to march from Dolores Park to the SF Federal Building. Wear white - it represents peace and unity. Bring parish, congregational banners and religious symbols. Asian Pacific Islander communities will gather at 12:00PM at the corner of 18th St. and Dolores St.
More on other immigrant rights actions. A diverse group of San Francisco politicians, progressive activists, and Chinatown residents packed an elementary school auditorium Monday night for a unique forum. 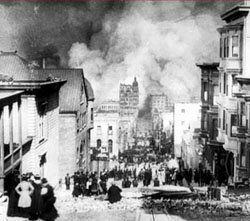 As the city marked the eve of the 100-year anniversary of the great 1906 earthquake and fire with a variety of commemorative events, “Ruin, Rubble and Race,” sought to connect the social fallout of that disaster with the reaction to Hurricane Katrina last year. Asian and Pacific Islander organizations are mobilizing and holding forums this week as well. Stand Up Against Anti-Immigrant Laws! Equal Rights and Dignity for All Immigrants! Following NAFTA in 1994, millions of Mexican communities were forced off their land and were given no other option to provide for their family than to risk their lives to find work in the U.S. In China, similar free trade policies have impoverished and displaced over 120 million farmers and migrant workers. Faced with long waiting lists and barriers to legal immigration, over 11 million undocumented immigrants, including nearly 1 million from China, have come to the U.S. in recent decades seeking a better life. The U.S. government’s response to the consequences of their own neo-liberal trade pacts has been to militarize the U.S./Mexic//o border and criminalize the very people that they displaced: immigrant workers. In 1882, the U.S. government passed the Chinese Exclusion Act to ban immigration of Chinese workers to the U.S. and prohibit Chinese immigrants from becoming naturalized citizens. This discriminatory law was eventually expanded to exclude all Asian immigrants and was not fully reversed until 1965. To pass these laws, racist politicians blamed Asian immigrants for “stealing” jobs from white Americans. Today, similar arguments are used by racist politicians to push new anti-immigrant laws such as HR 4437. Right wing groups and politicians have focused their recent attacks on undocumented immigrants. Regardless of your immigration status, this is just a way for the Bush administration to divide us and undermine the rights of all immigrants. In 1994, Prop 187 excluded undocumented immigrants in California from social welfare benefits. Two years later, the U.S. government cut off most legal immigrants from public health care, food stamps and cash assistance programs for the needy. The Oakland-based Applied Research Center is pointing its folks towards a piece in today's San Diego Tribune. In their Race in Focus email blast to racial justice activists and policy-makers like me, ARC 'raved' about the perspective from the Tribune. 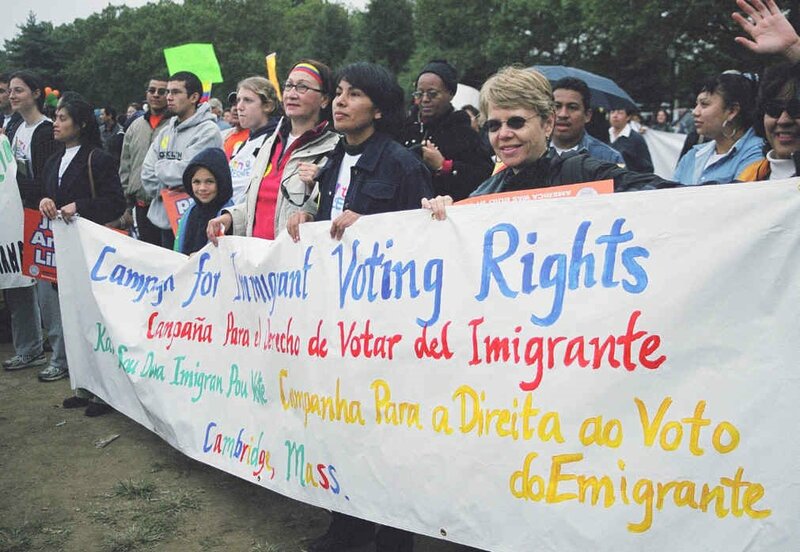 ...the young people of this country -- are walking out, marching, organizing and voting for humane immigration reform. You are about to meet the largest social movement of our decade. All across the country young people are organizing. Immigrants and non-immigrants, we are taking to the streets to protest some of the most racist legislation to ever enter the halls of Congress. We are walking out of our schools, organizing the social justice community and rallying our statehouses. More stories by Val Benavidez. More on the League of Pissed Off voters. The league's Blog. Lastly, one of my movement colleagues Carl Davidson of Chicagoans Against War & Injustice or CAWI and Networking for Democracy has written about the theory and practice of everything from registering new high school-aged voters to passing anti-war resolutions at the City Council level and impacting national elections. Radical NYU Education professor Jean Anyon at the AERA [American Education Researchers Association] conference last week called the burgeoning immigrant rights movement one of the most profound social movements of our time. 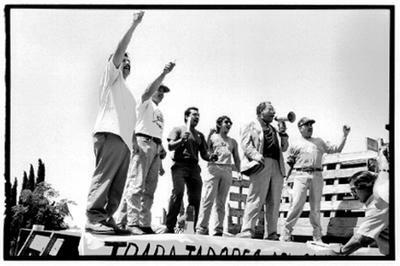 Whether the new movement's momentum and energy can be harnessed by our existing social justice organizatinos for longer term political power or whether new organizations will sprout up to lead for the future remains to be seen. But it seems to me that the Applied Research Center, League of Pissed Off Voters and Chicagoans Against War and Injustice, are asking the right critical questions for the future of our movements. The current highly restrictive law providing for teacher credentialing is SB 2042. 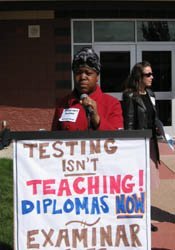 This act was a continuation of the practice of standards based education and testing as a measure of accountability, promoted by groups such as the Business Roundtable. These reductionist practices which brought us Open Court, the High School Exit Exam, and others. SB 2042 was developed and implemented through the Commission on Teacher Credentialing during the time when the chairs of that commission included the highly ideological Margaret Fortune and Alan Bersin. The current proposal: SB 1209 would require more performance assessment of future teachers without providing funds for this assessment. of beginning teacher induction professional preparation, as specified. Prior to developing new assessments to measure compliance with 2042, we need to first ask, Has anyone seen any evidence that 2042 has improved teacher preparation? If you know of any empirical evidence that SB 2042 has improved teacher preparation please let me know. More will follow on this issue including an assessment of the role of professional advocacy organizations such as ACSA and others. 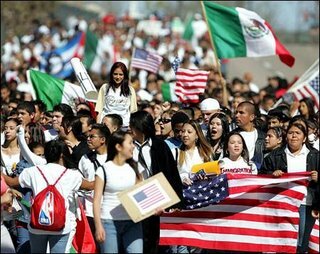 The LA Times, LAist and Reuters reported Saturday [Protesters Hit Streets to Support Immigrants] on another large student organized march and protest, this time on a non-school day. 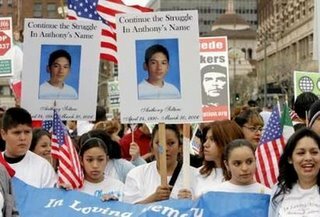 But with the suicide of Southern California middle schooler Anthony Soltero, the first 'casualty' of the 2005/06 battle for immigrant rights and against HR 4437 and other racist anti-immigrant legislation, students are stepping up with creative websites, blogs, and new organizing for their future. Those participating dedicated the march to Anthony Soltero, 14, of Ontario, whose mother says killed himself after he was disciplined for missing class to take part in an immigration rights march. School officials have said there is no ''corroborating evidence'' to support that allegation. 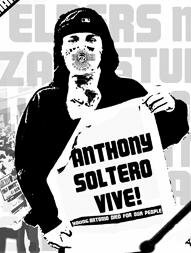 Some 20,000 Oakland immigrant rights protesters and student activists on Monday, April 10th also dedicated their rally and march to Anthony. See artist/activist Faviana Rodriguez' great blog for more on the growing movement in Oakland. Anthony's mother Louise Corales has said that her eighth grade son shot himself through the head on Thursday, March 30, after the assistant principal at De Anza Middle School told him that he was going to prison for three years because of his involvement as an organizer of the March 28 school walk-outs to protest the anti-immigrant legislation in Washington. She says that the vice principal also forbade Anthony from attending graduation activities and threatened to fine her for Anthony's truancy and participation in the student protests. The family's supporters say Anthony was learning about the importance of civic duties and rights in his eighth grade class. New policies, propositions, and initiatives to reform immigration are as frequent as the morning sunlight. 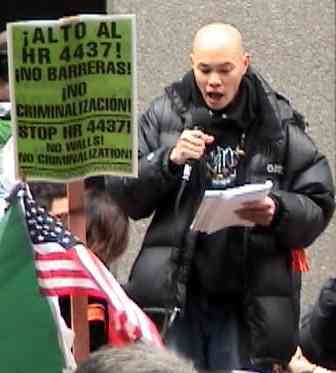 The new HR4437 bill has stirred up the social activist in everyone who has a friend, sibling, or parent who is undocumented and among those who believe in justice and equality for everyone. ...This web site is meant to provide a forum for students(and non-students) to post their comments or responses about the HR4437 Bill, their experiences at multiple rallies that have been organized nationwide, or to share their thoughts and feelings about immigrant rights. 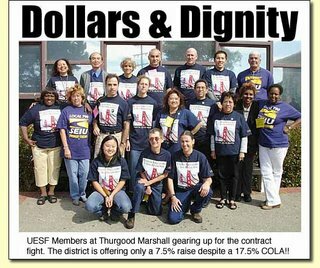 The SF Bay Guardian's "Dodged bullet: The issues and emotions behind the teachers strike that almost was" provides good teachers' insight into the SFUSD teachers/paras contract, including how former Superintendent Ackerman's large raise, golden parachute and lavish spending habits complicated the delicate labor negotiations. San Francisco parent leader Lisa Schiff also provides a useful analysis of how the SF teachers' strike was averted and how parents and communities need to unite to fight for adequate funding in Beyond Chron www.beyondchron.org. As a Board of Education member here in SF, I do know that the interim Superintendent Gwen Chan and the Board worked for several days around the clock to find common ground with the well-organized teacher's union [UESF] after the union members voted 87% in favor of a strike authorization. Since the settlement is only 'tentative' until it is voted upon by the UESF membership and then the full Board of Education, what I can say is that teachers and paras in our district deserve to be treated as professionals and to be paid a living wage. The United Educators of San Francisco, and SEIU 790 before them, organized at the grassroots level building strong ties with parents, school sites, and social justice and community-based organizations to pressure the Superintendent and Board to treat them with respect and to win a fair contract. But a parcel tax is insufficient for the revenue we need, and it is a local and partial solution to a state and federal level problem. Our goal should be to sufficiently fund all schools, not just our own schools. In that way, we help everyone and help ourselves too. 1. What do California school finance and governance systems look like today? 2. How can we use the resources we have more effectively to improve student outcomes? 3. To what extent are additional resources needed so that California students can meet the goals we have for them? But like many other middle class parents, Schiff fails to acknowledge how the funding crisis disproportionately harms African American, Chicano/Latino and students of color. My SF State colleagues Jeff Duncan-Andrade, Sean Ginwright, and Antwi Akom presented an incredible workshop at the AERA [American Education Research Assn] conference on Tuesday which focussed not only on their work in Oakland schools like the East Oakland Community High School [founded by immigrant rights hunger striker Wayne Yang and others], but also on the importance of racial justice organizing among teachers, students and parents in the lowest income communities of color. Jeff, Sean and Antwi [and I] have been influenced by the important educational justice work of Pedro Noguera of NYU. [see below for more on the loss of Pedro's partner Patricia]. Patrick Byrne [Overstock.com] who are reframing the education reform debate into one around high stakes testing, mayoral control of school boards, and standards and accountability. Lastly my deepest sympathies go out to Pedro [and his 4 children Joaquin, Amaya, Naima and Antonio] on the loss of his partner of 25 years -Patricia Rocio Vattuone. Hundreds jammed the Daly City, CA memorial last night to remember Patricia. She was the former Director of Parent Relations for the SF Unified School District, but I knew her for over 20 years as an amazing student organizer, schoolbus driver, SEIU union activist, and mother. Beyond Chron has great coverage on the upcoming 4/17 People's Forum on the SF Earthquake and building multiracial unity in times of disaster. 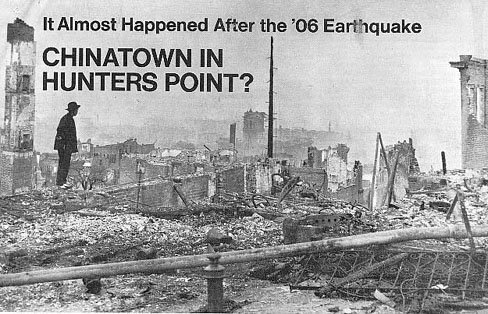 This week as the San Francisco City elites hold posh wine and cheese receptions and parties commemorating the 100th Anniversary of the Great 1906 SF Earthquake and Fire, grassroots community groups and activists will be dialoguing in Chinatown on the eve of the anniversary at the historic Commodore Stockton School [now Gordon J. Lau Elementary School] on lessons from the great earthquake and more recent disasters like Hurricane Katrina. Organizer Nicole Derse and others have put together the forum to draw lessons from these tradgedies for our movements to build stronger alliances and solidarity in times of crisis in the future. Join a diverse group of community-based organizations and activists for a “People’s Forum” to commemorate and critically reappraise what happened 100 years ago, and what must change today to save lives and prevent displacement of vulnerable, working people from the city’s landscape. Gordon J. Lau Elementary School950 Clay Street (between Stockton & Powell)Admission is free. Food provided. 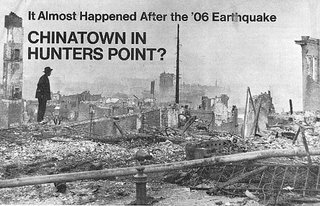 History has revealed that the 1906 Earthquake and Fire, and the monumental, post-disaster rebuilding efforts, gave tragic rise to a modern era of twentieth-century displacement and gentrification of working-class people, immigrants and communities of color throughout San Francisco. 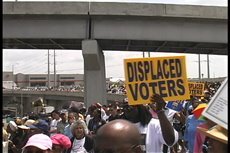 In 2005, the nation witnessed how Hurricane Katrina and the government’s racist and cruel response devastated the social and economic conditions of these same communities in the Gulf Coast region. Grassroots and People's Organizations like Critical Resistance, Malcolm X Grassroots Movement and Peope's Hurricane Relief Fund and Oversight Coalition also have good info. 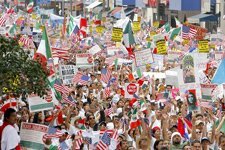 Just weeks after the massive Chicago, Los Angeles, Milwaukee and Denver mobilizations, the Associated Press is reporting now that Sunday's Dallas Immigrant Rights Protest drew historic record numbers of new activists half a million strong fighting for justice and dignity for immigrant communities. 50,000 more marched in San Diego and another 30,000 in St. Paul Minnesota. San Francisco Chronicle reporter Delfin Vigil also confirms those numbers in this morning's story, but he also gives voice to teachers, young people, and community organizers. Community High School, said, "Our (House of Representatives) basically wants me to see my students as criminals. Some of my students might be illegal immigrants. But they are students. They are not criminals." Pugao said he has noticed his students are increasingly aware of how they would be affected by the changes in the law. "The revolution might not be televised, but it is definitely being digitized," said Pugao. "The students are getting organized through text messaging, blogs, and Web sites like MySpace.com. They know exactly what's going on." He and others said the current debate has brought the Latino and other immigrant communities closer. "The mass media forgets that immigrants come in all colors," Pugao said. "The Irish, Chinese, Japanese all helped build this country. Even our governor is an immigrant." ...Arnoldo Garcia, with the National Network for Immigrant and Refugee Rights, also said local radio stations like KRZZ 93.3 FM La Raza in San Francisco deserve credit for explaining complex immigration issues. The Spanish-speaking stations' DJs first opened their airways for political conversation in the week leading up to a rally March 25 in Los Angeles that drew 500,000. "The Latino radio stations understand that they have got to get the word out because it's their audience who is under attack," said Garcia. "We're still preparing for something bigger because it's not going to take just one march to get what we deserve." full Chronicle story. 11:00AM - Press Conference at 24th St. and Mission St.
5:00PM - March from 16th St. and Mission St. to 24th St. and Mission St. But a full reading of the article suggests that the story is more complex than “privatization”. There is no question in my mind that CEOs want to shrink public space (parks, schools, hospitals, housing), but I don't believe they are in agreement with Norquist that they want to take it into the bathroom and drown in it the bathtub. They still want taxpayers to pay for socializing and sorting the work force. Transformation is not the same as destruction. Destruction is useful as a rallying cry for public school teachers, but it is not useful to get parents on board who feel that any change is better than what has been. Transformation may be a more accurate description than destruction to explain what is happening in Chicago, NYC, Philadelpia, New Orleans, Baltimore and other major urban public school systems. But transformation doesn't describe the emotional and psychological impact that such reforms are having on teachers. Union leadership, therefore, is trapped into defending a system from "destruction", a system, however, with which poor and working class parents of color have never been happy. This allows vouchers to be an effective wedge issue, destracting both parents and teachers from the real changes CEOs want to make. Klein is quoted in today's article, as calling the process “evolutionary restructuring.” Plato didn’t write the allegory of the cave for nothing. If we only look at the shadows --the effects of high stakes testing in the classroom -- and don’t read the policy literature that the people casting the shadows write for each other (see brt.org), we have only a distorted understanding of what is happening and why. And a distorted understanding leads to ineffective strategies and tactics of resistance. Granted, we will never really know with absolute certainty what the CEOs are up to in their pursuit of fundamentally restructuring public education (K-16)—I doubt they know themselves for sure, which is part of the problem. But we need to be more open minded about what the range of possibilities could be if we are going to be effective in resisting the changes. I don’t think it is a slam dunk that "the powers that be" are out to destroy public schools. If we can keep an open mind about this and debate the other possible goals, perhaps we can get some sharper definitions around the shadows, and thereby make our choice of strategies more effective? or maybe even develop some long range strategies? and then FRAME those strategies in a way that brings people to the barricades the way "destruction" is rallying teachers to charge into the valley of the shadow of death. To go back to the NY Times article about Phase II plans in NYC and to provide context from the perspective of my research, I would argue that the following quotations support the thesis that the CEOs are still looking to impose the model of Total Quality management, USA style, onto public schools. This model comes from envying Toyota’s success in the 1980s, wanting to imitate Toyota’s business model, but not to the point of actually giving up control to the line workers, as Toyota did. TQM is not a term used anymore, but the concept is still seen as the elusive holy grail by many of the top CEOs in this country, and have been acting upon their interpretation of it for the last 20 years. They want to (and have been able to) downsize middle management—central office staff, supervisors, even school boards. Upper management (operating through state legistators) keeps control of the goals of the production process (accountability by test scores and other hard data as well as determining the budget parameters). Line workers, ie teachers, take on management tasks (interpreting the meaning of test scores, developing instructional responses, writing grants, and deciding what services to outsource). This model is revealed in the quotations below from the same NY TIMES article. Outsourcing is not necessariyly destruction – it is part of the leaner and meaner system. Closers are not destruction either. IF a lot of schools are closed and pushouts increase – that is okay because the real point is to increase the numbers of students going to college just a little so a greater surfeit of college grads will bring down the salaries of high tech workers. Growing numbers of pushouts are acceptable becuase they can compete with other low skill workers to drive down un-living wages even lower (those who don't cooperate are being taken care of by the growing prison industrial complex). “A top goal is to find ways to relax much of the very centralization put in place by the Bloomberg administration and give principals a far freer hand, provided schools can meet goals for attendance, test scores, promotion rates and other criteria . . .
At Mr. Klein's direction, the consultants' most immediate mission is to create a framework for expanding the "autonomy zone," a pilot group of 42 schools whose principals were largely cut free of administration this year after agreeing to meet performance targets. Mr. Klein announced in January that 150 more schools would enter the zone this fall. The consultants are also working to fulfill the chancellor's pledge to redirect $200 million from administrative budgets to schools. But to hold principals accountable, the department must have a way to judge performance. So the officials and consultants, led by James Liebman, a former law professor at Columbia, are looking to develop more sophisticated measures of performance and to vastly increase the amount of data available to administrators and teachers . . . . And in granting autonomy, how can the school system avoid what some experts view as a flaw in charter schools — privately run but publicly financed — which is that if they fail, typically the only remedy is to close them? To give principals more control over school finances, the consultants from Alvarez & Marsal are mapping how every dollar flows through the system's $15 billion budget and how the flow might be altered. . . .what prices should be set if services like teacher training, now provided by the administration, were essentially for sale, to be purchased only by schools that want or need them? How can spending authority be given to principals without losing economies of scale? How can controls be established to prevent patronage and corruption? I feel like a fish out of water here in Chicago as a San Francisco school board member trying to stay warm while learning about the huge scale of Chicago social movements and the current big business generated 'reforms' at the City level. At the National School Boards Assn/Council of Urban Boards of Education conference here yesterday we heard a panel on how urban school districts are dealing with massive school closings. In San Francisco we have closed 8 schools and merged or moved a bunch more since last year in order to deal with declining enrollments for the past 5 years. There are probably more to come as our district [with communities and City partners] struggles to reverse the loss of 800-1000 students per year in our now 57,000 student district. But Chicago and Detroit and other urban districts seem to be going through what Education Week calls a 'death spiral' as they are losing students at an even faster rate and on a much larger level than San Francisco or Seattle. The ppt presentation from David Pickens, a young exec from Chicago Public Schools representing CPS CEO Arne Duncan, was chock full of numbers and policies and guidelines on how Renaissance 2010 [REN 10] and their school closings process is working. But my talks with community activists here give a much different story. Susan Ohanian posted a recent Phi Delta Kappan analysis by Bill Ayers and Mike Klonsky of what's really going on in Chicago's schools. School reform becomes part of what the authors call the “ownership society,” which cannibalizes everything from education to health care to retirement benefits, criminal justice, waste management, elections, public safety, and water rights. Any area that has traditionally been part of the common good and publicly administered is now up for grabs, and public schools are no exception. Public space is being divided into sectors to be sold off or privately managed. The Smalls Schools Workshop which Klonsky, Ayers and others founded in 1991 just celebrated their 15th reunion last weekend. The article summed up some of the important lessons from the struggle for small schools and a more democratic education system. Small schools are not a panacea, and, while they create wonderful possibilities, the language of small schools can be twisted to become an excuse for inequity and promotion of the ownership culture. Every wave of official “school reform,” including small schools and Ren 10, must be met with skepticism, agnosticism, and doubt by those of us who hope and struggle for a more democratic future, a more just social order. A school renaissance built on the ideals of the ownership society, on privilege for a few, on creating winners and losers among students and among neighborhoods will never sustain itself. On the other hand, small schools and classrooms built on equality and community, on shared power, on the right to humane treatment, on full participation, and on access can flourish and nourish a community. As a west-coast visitor to Chicago [for an urban schools meeting] I have been very lucky to hook up with some amazing community organizers, parents, teachers, small school movement folks out here in the past couple of days. Learning about the histories of the Haymarket Massacre 120 years ago, to the Harold Washington/Rudy Lozano and Rainbow coalition movements for justice and political power in the 80's, to the rich community organizing history of the Local School Councils, ACORN, and many other groups. What an amazing history of struggle Chicago represents. 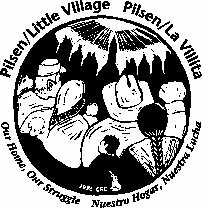 But the heart of today's burgeoning immigrant rights movement here is clearly the Little Village/Pilsen neighborhood- with a huge mostly Mexican immigrant population resides. The community also is adjacent to Cicero, which has become majority Latino as well over the last few decades. I visited 3 schools yesterday and hope to check out another amazing new community-based high school with a social justice focus that was WON through community struggle and a 19 day hunger strike by 13 community folks who were sick and tired of politicians' promises. More info on the Little Village Lawndale High School and info on the historic Little Village/Lawndale Hunger Strike for edjucational justice in May 2001. 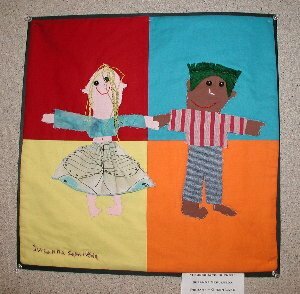 More info on the 12 year old Telpochcalli Community Arts Elementary School. My gratitude and props go out to Sue and Mike Klonsky of the Small Schools Workshop here, Carl Davidson of Networking for Democracy, the folks from the Little Village CDC, and former CPS administrator and now Community Links HS principal Dr. Carlos Azcoitia for their hospitality. 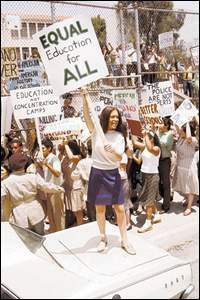 As San Francisco parents, teachers and communities led by SFOP and the folks from June Jordan School for Equity fight for a stronger small schools policy in our district today, these examples from Chicago's decades of organizing and history of people's struggle are very useful and profoundly inspiring. Just to listen to the other side, I listened to our local talk radio today. in Sacramento AM 1530. The anti immigrant fervor was intense. It ranges from vigilante justice to advocacy. These are the same folks who were able to recall Gray Davis as governor. What should be our responses? Just ignoring them does not seem viable. Check out 3 good reads on Racial Justice in education policy-making and on young folks and students breathing new fire into the immigrant rights and the new civil rights movements. Welcome to Race in Focus, an action newsletter of the Applied Research Center. With millions taking to the streets since the March 10th demonstration in Chicago, the political landscape and media reporting of immigration reform has shifted significantly. This week we focus on key trends and the impact they may have for California. Mass Mobilizations Refocus Debate: For the past four years, national security has framed discussions of immigration reform, employing a coded undercurrent of anti-immigrant hostility. Millions taking to the streets in Los Angeles, Detroit, Milwaukee, Phoenix, Dallas, and Charlotte have forced the media to focus on the human impact of immigration reform. Students Step Up: Tens of thousands of high school and elementary school students have led multi-day walk-outs across the state, even in such conservative strongholds as San Diego, Fresno, and Delano. California Politicians Forced to Change Their Positions: California Senator Dianne Feinstein, who has failed inexcusably to support immigrants' rights, was finally forced to stand up for comprehensive reform. Governor Schwarzenegger, who supported the Minuteman, has had to temper his position. His recent L.A. Times editorial stated, "We need a debate that attacks the issue without attacking individuals. And we need a comprehensive new law that respects immigrants and protects our nation." See L.A. Times Editorial. Also, New American Media had a great piece April 3rd focusing on youth perspectives on the immigrant rights movement upsurge. Angelides v. Wesley on school funding. LOS ANGELES - It wasn't the great debate that both campaigns promise is coming. But the two Democratic contenders for governor at least showed up in the same city and the same place - though two hours apart - Monday to contrast their visions for improving student achievement levels in California's struggling public schools and increasing access to higher education. Steve Westly, the state controller, promised to raise K-12 funding by changing the payout formula for the California Lottery to offer a smaller percentage in prizes for lottery ticket buyers and a larger share of revenues for schools. Phil Angelides, the state treasurer, sold his plan to tax high income earners and close corporate tax loopholes to pay for training and recruiting more teachers for public schools as well as rolling back student fee increases at the University of California and California state university systems. Angelides also chided both Westly and Republican Gov. Arnold Schwarzenegger, who say they don't support a tax increase, for being in denial over how to fund education. With the June 6 primary election nine weeks away, the two Democratic candidates preened their educational credentials and differing philosophies before the state convention of Education Trust - West, an advocacy group working on improving the quality of education for economically disadvantaged students. Westly, the first to address the gathering at the Omni Hotel in Los Angeles, remarked on the challenges faced by many minority and low-income students and charged that California is turning its back on public education. "We have tied their (students') hands with funding cuts, crowded classrooms and broken schools," he said. "If we want a high school degree to stand for something, we have to stand by our kids." Angelides, noting that California has the largest number of low-income students and English learners of any state, complained that the state ranks near the bottom in education spending, declaring: "We are never going to have first-rate schools with second-rate levels of investment." Turning his attention to Westly and Schwarzenegger and their stated resistance to raising taxes, Angelides said: "Let's be clear. I'm the only candidate for governor who will do what it takes to fully fund our schools and balance the state budget." Angelides has proposed closing unspecified corporate loopholes and raising taxes on families earning $500,000 a year or more to generate more revenue for education. On Monday, Westly pledged to squeeze more money out of the California State Lottery. Currently, the lottery guarantees 34.1 percent of revenues from ticket sales for K-12 schools, 53.9 percent for prizes and 12 percent for administrative overhead and retail commissions. Westly told the gathering that he wanted to cut percentage of the lottery prize money by an unspecified amount and shift some of the prize money to schools. His proposal seemed to challenge assumptions by state lottery officials, who have frequently said that big dollar lottery payouts lure more ticket buyers and, as a consequence, a greater share for education. Lottery revenues account for about two percent of total education funding. In an interview, Westly said he wasn't sure if he would need to bring a new initiative before voters to rewrite the lottery funding program from the 1984 voter-approved California Lottery Act or whether he could into law a reform measure passed by the Legislature. "While it was passed by voters," Westly said of the lottery initiative. "a lot of voters thought more money would be going to education." Though Angelides didn't comment on Westly's plan, his campaign director, Cathy Calfo said in a statement Monday: "Instead of real plan, Steve Westly has offered a phony lottery reform proposal that incredibly calls for slashing prizes while still selling the same number of tickets." The two Democratic candidates also disagreed on whether to roll back tuition increases approved by Schwarzenegger for the University of California and the California State University systems. Angelides said he would drop the tuition rates for all students to the levels before Schwarzenegger took office. Westly said he would seek a targeted increase in financial aid for lower-income students, but not a tuition decrease for all students. According to this story in the Sacramento BEE, the Education Trust/West hosted the events. Will you commit yourself to ending the underfunding of California schools k-12? I am looking for the answer to this question. In this morning's SF Chronicle reporter Tyche Hendricks and photographer Mike Kepa do something many other mainstream media do not - put a human face on immigrant families. The front page story has some amazing photos as well. Alternet this morning also ran an excellent piece summarizing the movement, promoting A10 in NYC and around the country and where we go from here. By Maria Luisa Tucker, AlterNet. Posted April 3, 2006. A contagious sense of optimism spreads as thousands of New Yorkers march for immigrants' rights. Perhaps the optimism was due to the sheer exhilaration of coming together and the palpable possibility of legalization, which would untangle many of life's problems for immigrants constantly in fear of la migra. The tone of the rally seemed to signal a real moment of opportunity in America -- a moment of possibility. ...The ... motivator is hope; since the Senate picked up the ball on immigration reform last week, there has been growing support for bipartisan legislation initially put forth by John McCain and Ted Kennedy. This legislation proposes a path toward citizenship for undocumented workers, provided they pay a fine and back taxes, learn English and pass a criminal background check. There is ample time for demonstrators to up the ante on the issue, as the full Senate moves closer to passing its version of immigration reform. If the Senate is able to approve an immigration bill, demonstrators will be sure to continue their call for compassionate immigration reform as congressmen attempt to reconcile the House and Senate legislation. Aided by Spanish-language radio, unions and immigrant rights groups, undocumented immigrants have become increasingly organized and bold in their calls for legalization. They are getting support from far corners of the political landscape. Republicans, Democrats, communists and progressives from Los Angeles and Houston to Denver, Phoenix and Chicago have rallied for legalization of undocumented immigrants. Monday, April 10: National Day of Action for Immigrant Justice will be the biggest day of demonstrations around the nation. The following cities have rallies in the planning stages: Houston; San Antonio; Austin, Texas; Dallas; St. Louis; Minneapolis; Detroit; Chicago; Pittsburgh; Philadelphia; Miami; Charlotte, N.C.; New Haven, Conn.; Danbury, Conn.; Hartford, Conn.; Birmingham, Ala.; New York; Boston; Milwaukee; Washington, D.C.; and many more. Monday - April 10 - San Francisco and San Jose solidarity actions are taking place on April 10th as well. Companeros Del Barrio is calling for folks to assemble at 16th and Mission St. at 5:00pm in order to march to 24th and Mission for a rally at 6:00pm. More info: 415-431-9925. A23 - Here in San Francisco - All out for Sunday April 23rd! 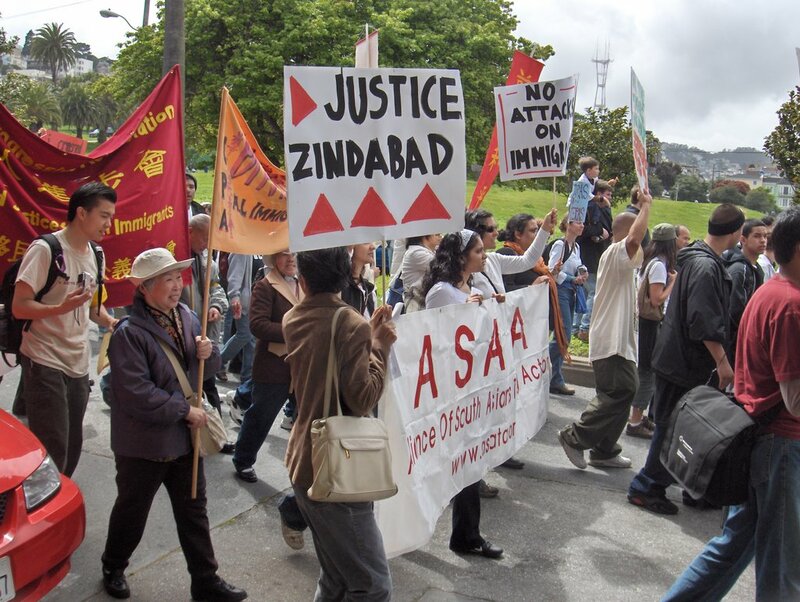 - the Bay Area Immigrant Rights Coalition is calling on faith-based and labor organizations and the broader anti-war and social justice movements to support a mass demonstration on Sunday April 23, 2006 at Dolores Park, in the Mission District across from Mission High School. Organizing student walkouts on the www.